SPRING SALE! Discounts on all RV covers and accessories! 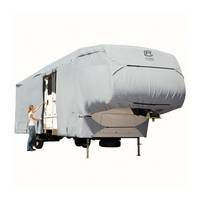 FREE SHIPPING on all RV covers to the lower 48 states! Tons of items IN STOCK! Select a length to help us find the best fit for you. To find the length to best fit your RV, measure from front to back, including bumpers, ladders, or any a/c or gas tank on the back. When you’re not using your 5th Wheel, protect it from the elements with an RV cover that’s designed to your trailers dimensions. 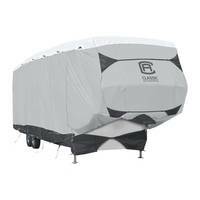 We stock UV resistant, breathable, and water-repellent Fifth Wheel RV Covers from ADCO and Classic Accessories. Shield your Fifth Wheel Trailer or Fifth Wheel Toy Hauler from costly cosmetic damage with a guaranteed fit cover. Get the correct size cover. Measure the overall length of your RV, including everything you want covered. RV manufacturers specs do not always include bumpers, etc. 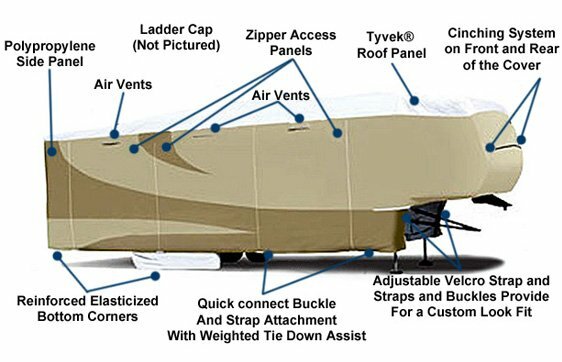 Learn more about our other travel trailer cover options and accessories. Customer service—simply put, we have the friendliest, most helpful representatives. Call us, Monday-Friday, 9 am to 5 pm eastern time—we’ll answer the phone. The Best RV Cover manufacturers in the business, Classic and ADCO, know and stand behind every product they make. Speedy delivery—we stock most of our RV products, and we’ll ship them the same day they are ordered. We know that you are ready to cover your Fifth Wheel, and you shouldn’t have to wait. Security—sensitive information is encrypted, credit card information is never stored, and we do not share personal information. Durability and Dependability—we stand behind our warranties and want you to be satisfied with your purchase. We have been around for over 15 years—and will still be here if you need us again. ADCO Products, Inc. is located in Valencia, CA. A 4th generation family owned sewing business established in 1955, ADCO is the oldest protective company in North America. 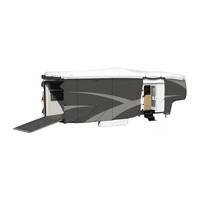 We offer 2 choices in ADCO RV covers, the Designer Series and SFS Aquashed. Since 1983, Classic Accessories has produced top-notch covers for many different styles of recreational vehicles, including the very popular Fifth Wheel trailers. Choose from the SkyShield or PermaPro materials which both come complete with a storage bag.